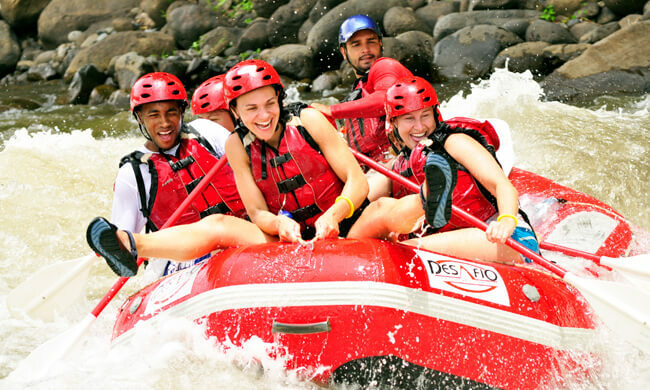 Climb Down Waterfalls and Glide Through the River in This Unforgettable Tour. This will be one of those days you will remember forever! Your Mambo Combo adventure tour begins when you are picked up from your hotel and driven 30 minutes by 4×4 into the quiet, rugged mountainous terrain nearby. When you arrive, the guides will give you a thorough safety talk about important rappelling & down-climbing techniques and will prepare you with a harness, helmet, and gloves. You are about to have an experience of a lifetime at the top of a canyon full of tropical waterfalls. Make your way along the river by down-climbing, river-tracing & rappelling a series of 4 waterfalls that gradually get bigger. The largest waterfall is 200ft! The hike back up takes 10 minutes. Take your time to enjoy the intense rainforest that surrounds you! Enjoy a snack and refreshments before beginning your rafting adventure along Rio Balsa! The Rio Balsa is perfect for beginners at a class level of II-III but still challenging enough. The guides will give you a safety talk and paddling instructions before you set off. Along the scenic river you can see lots of wildlife like monkeys, sloths and tropical birds such as ospreys, oropendolas, and toucans. Rio Balsa has 30 fun and easy-rolling rapids with names like “Congo Loco” & “Rock around the Croc” and the more challenging “Las Dragas”. After completing the rapids, there is time to swim in the river pools in an isolated rainforest river canyon! Finally, before going back to your hotel, enjoy a delicious, home-cooked Costa Rican meal. Note: Good physical condition required. This tour is challenging however, you do not need experience. What to bring: Comfortable clothes that will get wet, swimwear, secure shoes (tennis or water shoes), change of clothes. Duration: Tour time (8 hours) + travel time (approx 30 minutes each).